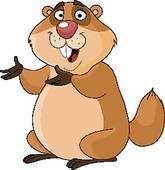 Why do we celebrate Groundhog Day and how can the kids get involved? Posted on Thu, Jan 26, 2012 : 6 a.m.
Groundhog Day is right around the corner. It is almost time for the groundhog to make his appearance. As tradition would have it, Groundhog Day is celebrated on Feb. 2 each year. Before Groundhog Day began as we know it, Germans who settled in Pennsylvania in the 1800s brought many traditions. According to Mother Nature Network, one of those traditions was predicting the end of winter based on bears' and badgers' habitation habits. The tradition of Groundhog Day really took off in the 1880s. A group of groundhog hunters in Punxsutawney, Penn. caught the attention of a local newspaper editor, Clymer H. Freas. "He became so enthralled by local groundhog folklore that he went on to promote Punxsutawney as home to a weather-predicting groundhog." Freas repeated and embellished this story year after year. 1. Study the origin of Groundhog Day - Some of the background of this day is given above. You can create a fun activity for kids by having them search for trivia questions or other facts about Groundhog Day. 2. Watch the movie Groundhog Day, starring Bill Murray - The day is the same over and over again until Murray finally sorts out his life, "and gets things right with the people around him." Make it a real movie going experience by serving popcorn, nachos, and other movie type snacks. Pass the Hog (played like Hot Potato) - Use a groundhog or stuffed toy; play music and pass the toy around to each person in the game. Whoever is holding the toy when the music stops is out of the game. Play shadow tag or do shadow play against a wall - Prizes can be awarded for the best shadow creatures. 4. Make Groundhog Day cookies or cupcakes - Shaping food into a groundhog can be fun for kids. What better time than this to have fun playing with food? Whether you live near Punxsutawney Penn. or not, many people celebrate Groundhog Day. Kids or kids at heart can both be a part of a Groundhog Day celebration. What’s your answer to why you celebrate Groundhog Day?